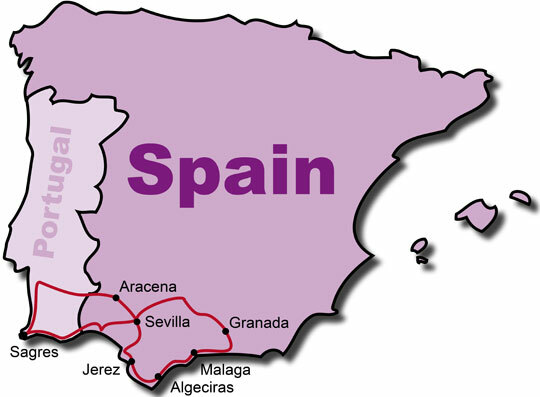 On this 7 day KeaRider motorcycle tour through Andalusia, you can get to know Spain's southernmost province, and take a trip to Portugal. Al-Andalus was the land of the Moors that left behind their beautiful Islamic monuments such as the Alhambra of Granada, which you will visit. After stopovers in the lively capital of the province Seville and in Aracena, your motorcycle tour heads to the Portuguese border and leads you further on to the Cabo de San Vincente with it's lighthouse on the Atlantic coast, the south westernmost point of Portugal. Along the beautiful Algarve coast back to Andalusia, where your road trip comes to an end in Malaga. After an individual journey, tour participants meet in Malaga on the Costa del Sol, where you will immediately head through the Sierra Nevada to Granada. The Alhambra, one of Andalusia's greatest highlights awaits you and also Seville, the lively capital of Andalusia, where you can experience the traditional Flamenco of the southern Spaniards live. A relaxed day is planned for today, where you will visit the Castillo de Aracena and stay the night in the village. Well rested you head on to the west through the scenic countryside of Andalusia over the Portuguese border up to the Atlantic coast and the prominent lighthouse Cabo de Sao Vincente as well as to the Portuguese national monument, the fort Fortaleza de Sagres. Along the Algarve you ride past the province capital Faro toward the Costa de la Luz and visit Spains largest natural reserve the Coto de Donana. Night's lodging is in the capital of the sherry and the center of the Andalusia horse breeding, in Jerez de la Frontera. After a sightseeing tour through the notable Sandeman Bodega and a live show "How the Andalusian Horses dance", we are heading to our historic hotel in Algeciras. The last day leads you to the remote White Mountain village Casares - crowned by the castle and church. After that you will pass an entirely different world in Marbella, the home of the rich and the beautiful, before you arrive in Malaga in the afternoon and start your individual journey back home.